Combine two favorite breakfast meats and add some brown sugar for a sweet-salty explosion of flavor. 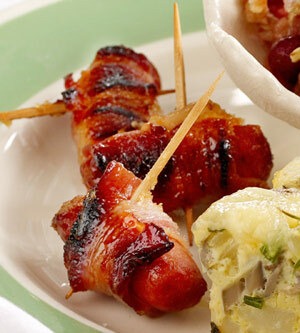 Serve as an appetizer or as a side dish with eggs at a brunch. Line a 15x10x1-inch baking pan with foil; lightly coat with cooking spray. Set aside. Wrap each sausage link with a bacon piece, overlapping the bacon piece at the end. Press the end of the bacon piece to seal or secure it with a wood toothpick. Place brown sugar in a large plastic storage bag. Add several bacon-wrapped sausages at a time and seal. Shake bag gently to coat sausages with brown sugar; place in prepared pan. Repeat with remaining bacon-wrapped sausages. Bake in a 350 degree F oven about 30 minutes, or until the bacon is browned. Serve immediately. Makes about 45 smokies. Prepare the recipe as directed above through step 3. Cover and chill the sausages for up to 24 hours. To serve, uncover and bake as directed in step 4.